Hello everyone! 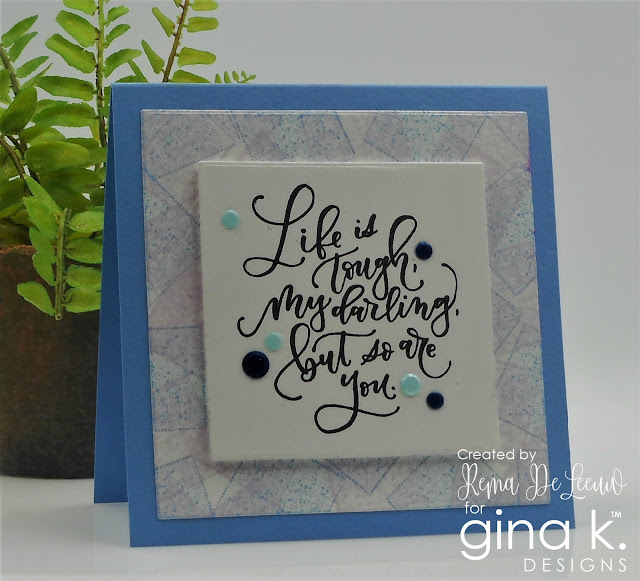 Today I am participating in the first MMC over at Gina K. Designs hosted this month by Cat. She has chosen the theme "My Sentiments Exactly". You have until Jan. 31st to upload your project. Also new this year, there will be three $25 gift certificates awarded to three randomly chosen winners. You can find the challenge and details by clicking here. Here is my card featuring a sentiment from Lettered and Lovely. My background was created by gently taping Lovely Lavender and Powder Blue GKD mini inks to my cardstock. You can find these products and more at Gina K. Designs. You so nailed this months challenge. Square with round dots just makes the whole thing sing. Lovely card. Love how you created the background. I love the background which shows off this wonderful sentiment so well. This is a beautiful card design. Love your background, Rema! Just perfect!